A report by the firm's research analyst Chris Whitmore noted the company is using Good Technologies' third party iOS app in conjunction with Microsoft Exchange Server to deliver enterprise email and calendar data to mobile users with AES 192 encryption. This separates corporate data from any private email and calendar accounts a user sets up independently on their iPhone. The process of setting up Good's software on the user side was reported to take 10 to 15 minutes. 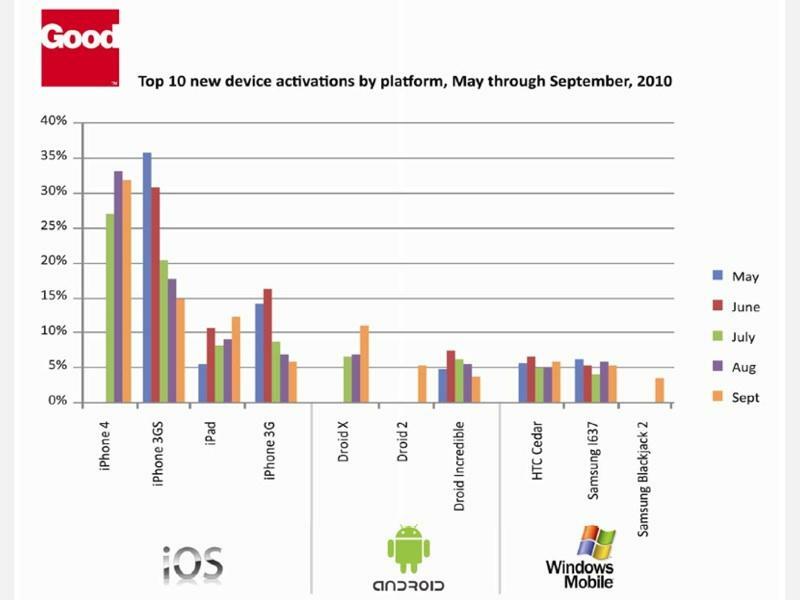 Good itself recently profiled Apple's iPhone as being the center of attention among enterprise users, with over half of its new device activations worldwide involving an iPhone or iPad, outnumbering Android, Windows Mobile and Symbian put together (Good does not work with BlackBerry devices). "We found enterprise email on iPhone was a fantastic experience as it was easier/faster to access data (touch UI) than on the Blackberry," the report stated. "It was also great to only have to carry one device for personal and corporate email access." Currently a BlackBerry shop, Deutsche Bank noted two "minor" disadvantages to the iPhone/Good combination being tested against RIM's BlackBerry/BlackBerry Enterprise Server package. "The other under-appreciated feature on the Blackberry," the report stated, "was the blinking red light to signal new email. The iPhone has no equivalent which was a point of frustration as it required logging into the app frequently when awaiting a specific email." Other differences were described as personal preferences. "We had mixed views regarding typing on the iPhone," the report said. "The Blackberry-faithful among us prefer the familiarity of a physical keyboard. Others preferred the iPhone when rotated into landscape mode, as it allowed for faster typing with few errors. "In aggregate, we found the iPhone UI was very usable and the touch-less vs. physical keyboard debate is a function of personal preference and perhaps fatness of fingers. Versus the Blackberry trackball, the iPhone interface is vastly superior is terms of speed and accessibility and prioritizing key emails and we view the Blackberry trackball as archaic and cumbersome." Whitmore added, "after testing corporate email on iPhone for the past few months, there is no going back. We expect a lot of users will feel the same way when iPhones are offered at their workplaces." The report specifically noted "the ability to carry a single device with a great UI and have access to multiple apps (like Bloomberg, for example) far outweighed these issues." Apple's App Store "is a huge competitive differentiator," Whitmore wrote, citing survey data from more than 2000 mobile app developers reported by IDC and Appcelerator, which "showed software developers prefer the iOS platform: 91% of developers 'very interested' in developing for the iOS iPhone, 84% for iPad, followed by 82% for the Android phone and 62% for the Android tablet, 34% on Blackberry, 28% on Win-phone and 16% for each of the Blackberry tablet, webOS phone and webOS tablet (expected later this year). "Nokia continues to struggle in the Smartphone market with developers showing minimal interest in developing for the Symbian (13%) and MeeGo platforms (7%). "Developer interest in the iOS platform has increased over time with a significant spike in iPad interest (~54% in March, 2010 to ~84% in June, 2010) in conjunction with the introduction of the iPad. We continue to believe that iOS is the gold standard (iPad and iPhone) and favored platform for developers and we expect that trend to continue. Specifically we believe iPhone on Verizon, iPhone 5 and iPad 2 refreshes on the horizon will attract additional developer interest and users which in turn propagates the virtuous cycle that makes the iOS platform so valuable." Whitmore added, "we are modeling CY11 iPhone units of 67M and 30M iPads which we view as conservative in light of the upcoming Verizon launch, iPhone 5 and iPad 2 in the next 6 months. Apple remains a top pick and we reiterate our Buy rating."